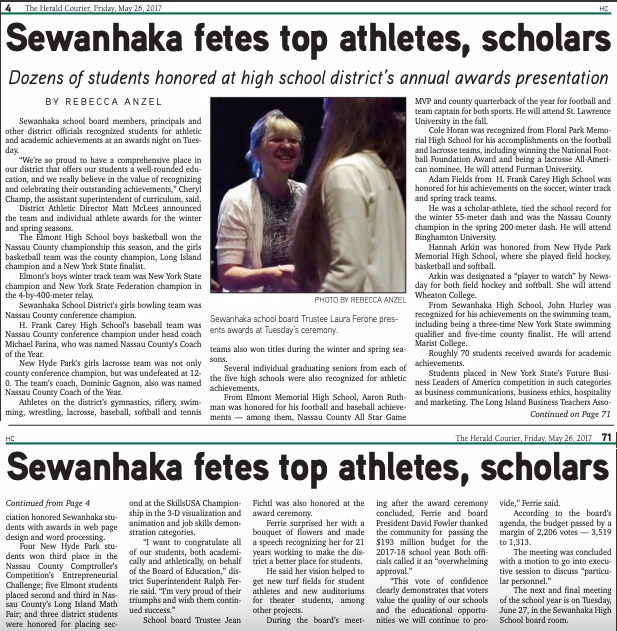 Sewanhaka school board members, principals and other district officials recognized students for athletic and academic achievements at an awards night on Tuesday. “We’re so proud to have a comprehensive place in our district that offers our students a well-rounded education, and we really believe in the value of recognizing and celebrating their outstanding achievements,” Cheryl Champ, the assistant superintendent of curriculum, said. District Athletic Director Matt McLees announced the team and individual athlete awards for the winter and spring seasons. The Elmont High School boys basketball won the Nassau County championship this season, and the girls basketball team was the county champion, Long Island champion and a New York State finalist. Elmont’s boys winter track team was New York State champion and New York State Federation champion in the 4-by-400-meter relay. Sewanhaka School District’s girls bowling team was Nassau County conference champion. H. Frank Carey High School’s baseball team was Nassau County conference champion under head coach Michael Farina, who was named Nassau County’s Coach of the Year. New Hyde Park’s girls lacrosse team was not only county conference champion, but was undefeated at 12-0. The team’s coach, Dominic Gagnon, also was named Nassau County Coach of the Year. 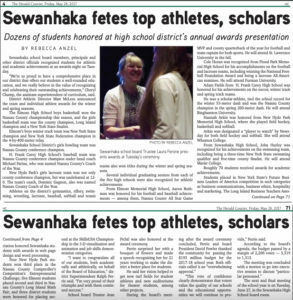 Athletes on the district’s gymnastics, riflery, swimming, wrestling, lacrosse, baseball, softball and tennis teams also won titles during the winter and spring seasons. Several individual graduating seniors from each of the five high schools were also recognized for athletic achievements. From Elmont Memorial High School, senior Aaron Ruthman was honored for his football and baseball achievements — among them, Nassau County All Star Game MVP and county quarterback of the year for football and team captain for both sports. He will attend St. Lawrence University in the fall. Cole Horan was recognized from Floral Park Memorial High School for his accomplishments on the football and lacrosse teams, including winning the National Football Foundation Award and being a lacrosse All-American nominee. He will attend Furman University. Adam Fields from H. Frank Carey High School was honored for his achievements on the soccer, winter track and spring track teams. He was a scholar-athlete, tied the school record for the winter 55-meter dash and was the Nassau County champion in the spring 200-meter dash. He will attend Binghamton University. Hannah Arkin was honored from New Hyde Park Memorial High School, where she played field hockey, basketball and softball. Arkin was designated a “player to watch” by Newsday for both field hockey and softball. She will be attending Wheaton College. From Sewanhaka High School, John Hurley was recognized for his achievements on the swimming team, including being a three-time New York State swimming qualifier and five-time county finalist. He will attend Marist College. 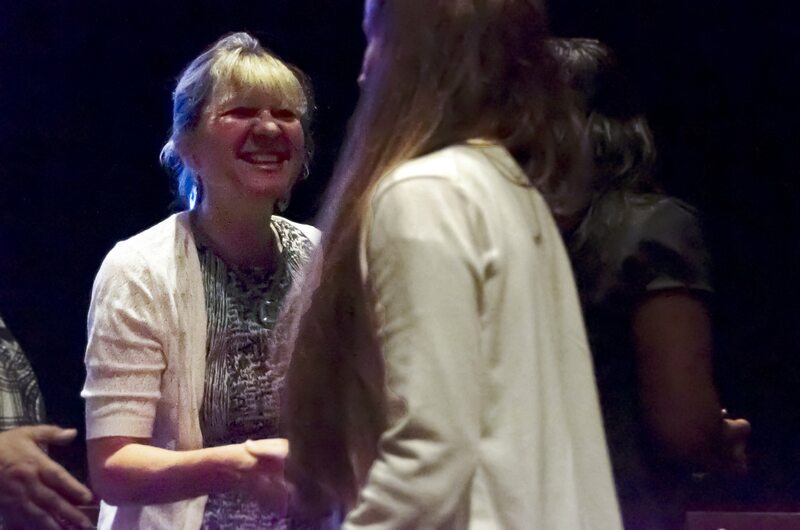 Roughly 70 students received awards for academic achievements. Students placed in New York State’s Future Business Leaders of America competition in such categories as business communications, business ethics, hospitality and marketing. The Long Island Business Teachers Association honored Sewanhaka students with awards in web page design and word processing. Four New Hyde Park students won third place in the Nassau County Comptroller’s Competition’s Entrepreneurial Challenge; five Elmont students placed second and third in Nassau County’s Long Island Math Fair; and three district students were honored for placing second at SkillsUSA Championship in the 3-D Visualization and Animation and Job Skills Demonstration categories. School board Trustee Jean Fichtl was also honored at the award ceremony. Ferrie surprised her with a bouquet of flowers and made a speech recognizing her for 21 years working to make the district a better place for students. The New Hyde Park Herald Courier published this piece in print on Friday, May 26, 2017. He said her vision helped to get new turf fields for student athletes to play on and new auditoriums for theater students to perform in, among other projects. “This vote of confidence clearly demonstrates that voters value the quality of our schools and the educational opportunities we will continue to provide,” Ferrie said. According to the board’s agenda, the budget passed by a margin of 2,206 votes — 3,519 to 1,313. The next and final meeting of the school year is on Tuesday, June 27, in the Sewanhaka High School board room.